“My children are treated as foreigners, even though they were born here. It makes me so angry! 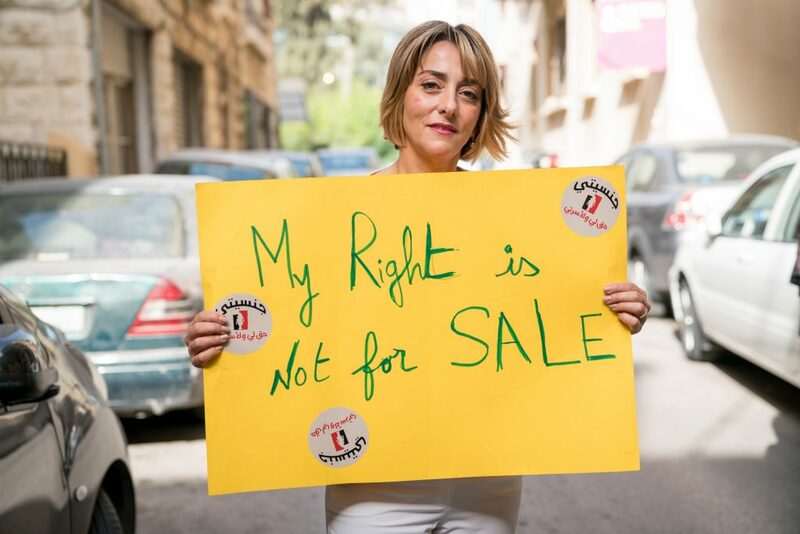 They should have the same rights as everybody else.” Nadira Nahhas, of Kvinna till Kvinna’s partner organisation CRTD.A, fights for equal citizenship rights in Lebanon. Having citizenship rights is anything but a given in Lebanon, even for those who were born in the country, with a Lebanese mother. Because Lebanese women are prevented by law from transferring their citizenship to their children, children with non-Lebanese fathers are in many ways excluded from society. They do not have the right to vote, for example, and only limited access to health care. Lebanese men however, automatically pass on their citizenship to their children. CRTD.A campaigns relentlessly to change this discriminatory legislation. “We want everyone to have the right to citizenship, regardless of where their parents are from,” says Nadira Nahhas, who has been working with the issue for over ten years. CRTD.A’s office in central Beirut is the main hub for the organisation’s activities. Several floors up in a multi-storey building, employees and volunteers work side by side. Coffee and tea are served in small paper cups, and in the meeting room, a round-table workshop is taking place. About ten men and women of different ages are there to learn more about human rights. One of the participants is Nadira. She listens intently and takes notes. “I’ve learnt about women’s rights by getting involved. And I’ve started talking to politicians, to influence society.Working for CRTD.A has made me a better and stronger woman,” she says. Nadira’s husband is an American citizen. But even though they are married, he can neither get citizenship nor the right to work in Lebanon, because Lebanese women cannot transfer citizenship to their husbands either. So Nadira’s husband commutes to Saudi Arabia to work. On that front, however, progress has been made. Thanks to CRTD.A’s campaigning, parents like Nadira and her husband are no longer forced to pay. Still, their children always need to be in possession of a valid passport and have their documents in order. Without citizenship, many career paths are forever out of reach. This is something Nadira and her family particularly regret. The CRTD.A estimates around half a million women, men and children are affected by citizenship right restrictions. The subject was taboo for a long time. But thanks to civil society’s awareness-raising campaigns, it has become a topic of public discussion and received media attention in recent years. “Today, everyone is aware of the problem. Politicians are even discussing the issue in parliament now,” says Nadira. How are things for women in Lebanon? When she was younger, Nadira studied in the United States. Upon her return to Lebanon, the differences between the two countries became very clear to her. But none of this discouraged Nadira from being an activist. If anything the opposite occurred. “I will keep fighting to change the citizenship law. At CRTD.A we believe we will succeed. Whether it’s sooner or later,” says Nadira. CRTD.A is a driving force in the struggle for Lebanese women’s right to transfer citizenship to their family members: today, only Lebanese fathers and husbands can do so. The organisation has extensive experience of working for gender equality, including women’s political and economic empowerment.